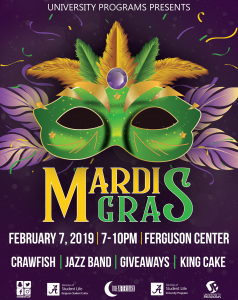 University Programs will be hosting Mardi Gras on Thursday, February 7, 2019 from 7-10 p.m. in the Ferguson Student Center. Students will be able to enjoy and experience Mardi Gras as if they were in New Orleans or Mobile! Several attractions will be available for students to enjoy, including tie-dying shirts, wax hands, face painting, DIY Mardi Gras masks, and more! Decorations will include pennant flags hanging from the ceiling, beads, balloon arches and colorful masks. Food will include wings, king cake, gumbo, crawfish, and other snacks will be provided. Each student will receive a raffle ticket when they arrive at the event, and giveaways will be announced throughout the night.